Our guest today is Gilles Bachelet, author and illustrator of Mrs. White Rabbit. 1. What inspired you to write Mrs. White Rabbit? For a long time I had wanted to do something around the Lewis Carroll universe, and I asked myself what I could bring personally to the history of Alice (which innumerable illustrators before me have considered as well). Not being particularly gifted in drawing children, I was looking for a way to bypass that difficulty and not put Alice in the foreground. That gave me the idea of focusing on the character of the White Rabbit and inventing, through him and his little family, a parallel story to the original story. Writing the text in the form of a diary by Mrs. White Rabbit appeared to me later as an opportunity to consider the condition of women in the context of Victorian England. 2. Who do you think would enjoy reading Mrs. White Rabbit? It is of course, before anything else, a book meant for children, but I think that the story of Alice follows us our whole lives. As for the question of the place of women in society, that concerns both the young and their elders. I really love the idea that a book for children can also be a pleasure shared with adults. For that reason, as long as it didn’t interfere with the story for children, I didn’t stop myself from placing in my illustrations some allusions or references that children wouldn’t be old enough to understand. 3. What is your favorite illustration/page in Mrs. White Rabbit? 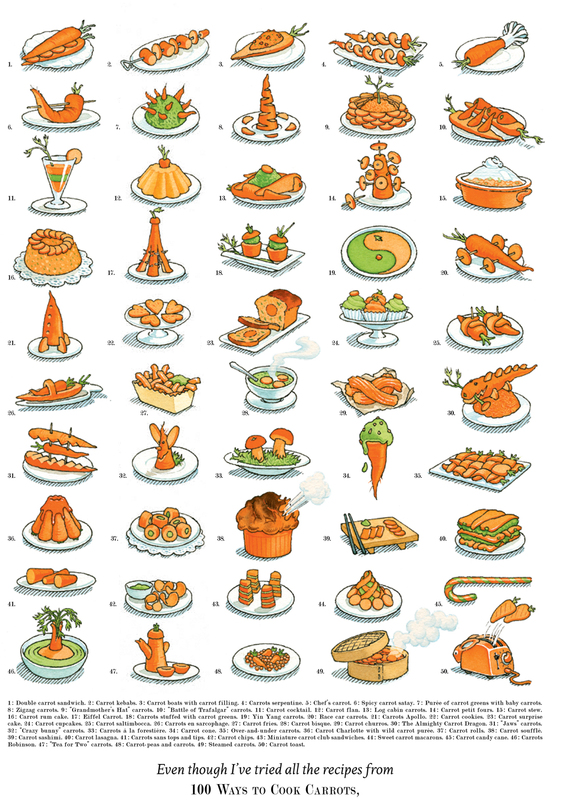 I think it’s the two-page spread of Mrs. White Rabbit’s recipes. 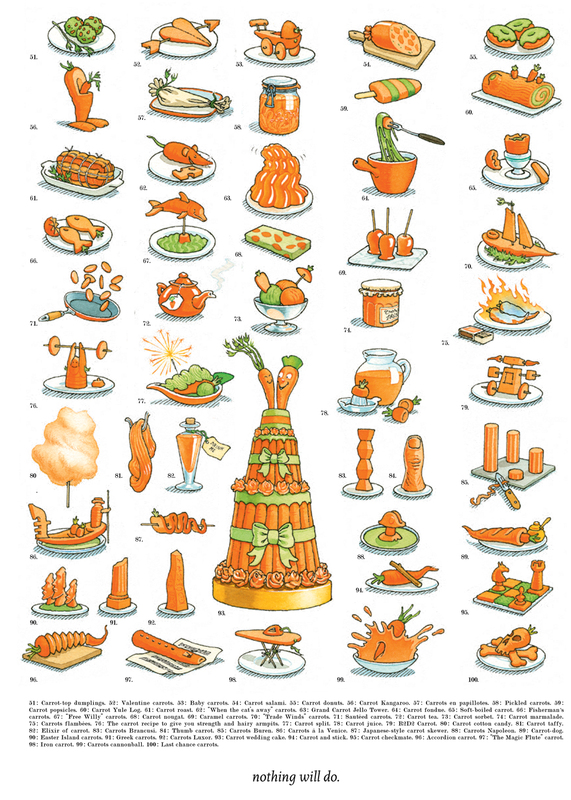 That was an idea that amused me and was also a small challenge: to find 100 different carrot recipes without knowing when I started how I would find a place for them in my story. So to justify that page, I imagined that the older daughter wanted to become a model and refused all food to watch her figure, making her mother deploy all the treasures of her culinary imagination. 4. Which artist or work of art has most influenced your own illustrations? My influences in regard to illustration are numerous. They range from Flemish painting and the comic books of my childhood to Hokusaï, the great illustrators of the 19th century, and other more contemporary artists such as Maurice Sendak or Tomi Ungerer. In Mrs. White Rabbit I pay particular homage to the great English illustrator Beatrix Potter. One can see, on the first page where Mrs. White Rabbit writes in her journal, the book Peter Rabbit open in the foreground, and it is in her honor that I named the older daughter in the book Beatrice. 5. What are you doing when you’re not writing or illustrating books (or answering questions for Eerdlings)? I teach illustration in an art school and I spend a lot of time in grade schools talking about my work, about children’s books, and about the life of an illustrator. I have had many other passions at different periods in my life—the circus, magic, music—but the main thing remains drawing. Read the Publishers Weekly review of Mrs. White Rabbit.